Come along and listen to local poets from Aberdeen Writers' Circle, Dead Good Poets, Huntly Writers, Lemon Tree Writers and Spring Tides Poetry Group reading their own poetry and guitar music by Ian Watt. Ian Watt studies at Aberdeen City Music School. Recent performances have included four concerts in Paris. 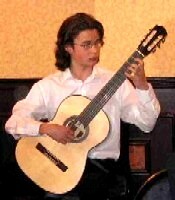 He passed the classical guitar Associated Board Exam (grade 8) with distinction and holds the school record for highest mark. As well as classical music, Ian plays electric guitar, sings with his group Steely Glint, and is an accomplished jazz musician. He has just turned 15. Open to all. Booking recommended. For more information please contact the Museum on 01224 311200.